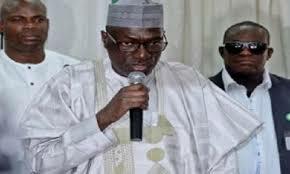 The Senator Ahmed Makarfi -led faction of the Peoples Democratic Party has called for the setting up of an independent commission of inquiry to probe the events that led to the suspension of the Secretary to the Government of the Federation, Mr. Babachir Lawal and the Director General of the National Intelligence Agency, Mr. Ayo Oke. Makarfi, who is heading the party’s national caretaker committee, which is still contesting its sacking by the Court of Appeal at the Supreme Court, described the suspension of the two men as a ruse. The two men were suspended by President Muhammadu Buhari in Abuja on Wednesday. While the former SGF was suspended over alleged contract scam in the North-East, Oke was asked to step aside following the discovery of more than $43m at a private residence in Ikoyi, Lagos last week. Oke was alleged to have kept the money where it was found. However, Makarfi said that he was not surprised that some Nigerians have applauded the suspension, which he said might have indicated a new commitment by President Buhari to fight the anti-corruption war without fair or favour . He nevertheless said that he and his team were constrained to point out that the action was another ruse to deceive Nigerians and dress up what he described as the failed anti corruption war, in a new garb. The former governor of kaduna State, stated this in a statement signed by the spokesperson for the caretaker committee, Prince Dayo Adeyeye, in Abuja in Thursday. He asked Nigerians to recall that the Senate had earlier set-up an Ad-Hoc Committee in 2016 headed by Senator Shehu Sani, a Senator representing Kaduna Central, to investigate the expenditures and activities of the Presidential Initiative for North-East , which Babachir in his capacity as the SGF was overseeing. The committee, he said, also investigated the alarming rate of humanitarian crisis in the North-East occasioned by the diversion of grains from the Strategic Grains Reserve and other food supplies meant for the Internally Displaced Persons in that Region. Adeyeye, a former minister of state for works, said that the committee indicted the suspended SGF for the alleged mismanagement of PINE Funds and the award of multi-million Naira grass Cutting Contract to one of his companies, Rholavision Engineering Limited and other ghost companies.